Whether there’s too much or not enough water in your customer’s pipes, both have pest consequences that can be prevented. The inside of an unused pipe that needs to be capped (note American cockroach droppings). Of course, where there are plumbing problems there is potential for pest problems. Leaks offer standing water to rodents, and clogged, scummy drains are breeding sites for flies. On the other hand, drains and pipes without water can also lead to pest problems when those spaces are used for movement and harborage. Recognizing and addressing these conditions can help you to eliminate pest problems at the source and avoid expensive callbacks. FINDING THE SOURCE. With limited service time at an account, rapid inspection techniques can help to quickly locate areas of actual or potential pest activity, leading to quicker treatment and resolution of the problem. Efficient inspections include simultaneous targeted and generalized evaluation of the site. Targeted inspections can be thought of as a top-down approach and involve interpretation of monitoring information. 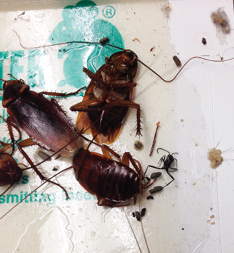 What pests are present on glueboards, insect light traps and pheromone traps during your visit? Many pests are predictable in their food source, and thus their breeding sites. By accurately identifying the pest and knowing a little about its biology (or reading about it in one of the many industry manuals), we can form a hypothesis about the type of breeding conditions that must be present for that pest to be found. I think of this like a mental matching game, connecting a pest to its preferred habitat. A floor drain with debris. Pipe connections: If not properly sealed, water can escape where two pipes meet. Missing tile grout: As floors are wet-washed, grout can erode and leave deep gaps between tiles. Water in these gullies may not flow toward floor drains, creating small, connected pools of water. Cracks and crevices: Especially near the sink, water and food particles can collect in cracks and crevices. Floor drains: When blocked by solid debris, eroded or improperly maintained, drains can be clogged and retain water. Drain lines: Rubber hoses used to drain spillage on bar tops and other areas rely on gravity to move liquids to the floor drain. When portions are not angled correctly, sugars and food spillage can get stuck in these drain lines and provide a breeding site for fly larvae. Air gap splatter: Gaps between a downspout and basin are used to prevent backflow of septic water into food preparation sinks. While this design can prevent contamination, it can lead to sanitation problems when food particles splatter as they hit the basin. Condensation: Cold water pipes in a warm, humid room can “sweat,” forming droplets of water that can drip or otherwise provide liquids for pest development. A pipe with an air gap and debris. TOO LITTLE WATER. In contrast to excess water facilitating pest development, a lack of water in some pipes can provide harborage for pests and requires the addition of water. To understand why, let’s take a quick look at plumbing traps. If you have ever looked under the sink, you are familiar with a plumbing trap; that U-shaped pipe that (typically) changes the flow of water from vertical to horizontal. The main function of the trap is to create a water seal that prevents odors and harmful sewer gasses from escaping into the structure. Each time the drain is used, fresh water replaces standing water in the trap, maintaining a permanent seal. A benefit of this design is that it deters pests from using pipes to move within or between buildings. Yes, cockroaches and rodents (especially rats) can overcome plumbing traps by crawling through a small amount of water, but regularly-used drains are less likely to harbor pests. Problems with trap seals occur when drains are infrequently used and water evaporates over time, or if drains are clogged with debris. Floor drains in locations that do not wet mop floors, in production areas with lots of small spilled items, or drains near a deep fryer are susceptible to drying out. ELIMINATING THE SOURCE. For every problem identified above, there is a solution to eliminate conducive conditions. While the responsibility for addressing any particular issue may belong to the building manager, pest professionals can provide add-on services that remove breeding sites and can halt pest activity. Pipe connections: For pipe connections that consistently leak, a professional plumber should be consulted. The plumber may disassemble the connection to install Teflon tape or pipe joint compound. This type of work can be recommended by a PMP, but should not be attempted without proper licensing. Missing tile grout: Some pest management companies offer services to replace tile grout in commercial settings. This value-added service gives your company control over conditions that promote pests, unlike other structural issues that require cooperation of site management. 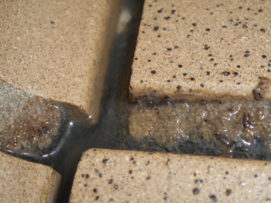 Drain fly larvae between tiles that are missing grout. Cracks and crevices: An appropriate sealant can be applied to cracks and crevices to prevent food and water from accumulating in these spaces. This is not a one-time fix, as sealants need to be maintained properly for long-term exclusion. Floor drains: Technicians should be in the habit of checking floor drains and air gap drains during their inspections to verify that water is present in the trap (Inspection Tip: many floor drains can be easily opened using a cotter pin remover). For traps that have dried out, the solution is easy — inform the client that water should be poured down the drain until the trap is full and maintain the drain in that manner. If drains are clogged, pest professionals equipped with an appropriately sized drain brush [cheap] or power-washer [expensive] can remove debris that provides harborage for pests such as drain flies and dark-eyed fruit flies. Drain-cleaning services can be sold as a monthly or quarterly treatment to ensure that organic debris does not accumulate in drains. Drain solutions: There are microbial and enzyme-based products on the market for drain cleaning. The caveat to these products is that they are not effective at removing large accumulations of debris. Rather, these products can be used in combination with mechanical drain cleaning to slow the build-up of residue. Drain lines: Drain brushes with a flexible line can be used to clean these hoses. However, a permanent solution would be to educate customers that drain lines should be oriented to work with gravity and eliminate standing water and debris. Condensation: Part of the problem with sweating pipes is humidity. Clients can take steps to reduce humidity, including the installation of a dehumidifier. Cold pipes also can be insulated to prevent moist air from contacting the cold surface. Cap it: If a pipe is cut and no longer functional, cap the end to create a permanent seal and prevent pests from moving in and out of this area. A targeted inspection near a source with adult and nymph roaches and a cockroach egg parasitoid (ensign wasp). YOUR SAFETY. The most alarming response I see to “pests of the pipes” is the off-label use of pest strips. These products, which slowly release vapor from a resin plastic block, can be used in confined spaces where people will not be present for more than four hours. Most pest strips come in two sizes (16 grams or 65 grams), and are designed to treat 100 to 1,200 cubic feet for up to four months (1,200 cubic feet is equivalent to a room that measures 10 by 15 by 8 feet). Yet these devices have been placed near the drain in an open area where people are working all day, sometimes in numbers that far exceed the designated application rate. Because these devices are easily available at Big Box stores, site managers are often the ones responsible for this misapplication. Effort is needed to educate personnel that this type of treatment is illegal [off-label], dangerous, and ineffective. A second, and similar educational opportunity for pest professionals is to inform site management that pouring bleach and/or hot water down the drain will not eliminate pest activity. These “treatments” do not remove the organic debris that sustains pest populations in drains. SUMMARY. Pest problems in commercial settings can arise for several reasons, but the close link between preferred sites and water can increase inspection and treatment times to identify and address a problem. Technicians should be familiar with common water sources, and identify these as part of the generalized inspection. When dealing with a particular pest, targeted inspections that aim to identify the breeding site should be undertaken. In most cases, conducive conditions can be addressed or eliminated through sanitation, leading to long-term control and reduced callbacks. The author is a pest management specialist in the New York State IPM Program at Cornell University. Contact him at mfrye@gie.net.